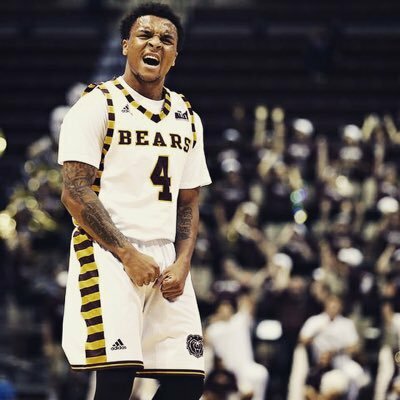 Missouri State was well represented with four individual men’s basketball honors presented to the Bears in the first round of Missouri Valley Conference postseason awards announced by the league office. Junior Dequon Miller was named as the MVC’s Newcomer of the Year, in addition to earning All-MVC honorable mention and All-Newcomer Team laurels. Freshmen Obediah Church and Jarred Dixon also earned conference distinction on the MVC All-Freshman Team. Miller, a transfer from Motlow (Tenn.) College, leads the Bears with 12.7 points per game in 30 starts with team highs 54 3-pointers and 88 assists. In league games this winter, he averaged 13.4 points per game – which ranks seventh among all MVC players – and is among the league’s top 10 scorers for the season. His 36.1 minutes per game in MVC play is the second-most in the conference, while his 1.9 3-pointers in Valley play is the sixth-best average in the league. He is a five-time Missouri Valley Conference Newcomer of the Week this season and is the fifth Bear to earn the league’s top newcomer award, joining previous winners Danny Moore (1997), Mike Wallace (2001), Spencer Laurie (2007) and Adam Leonard (2010). Church has also started all 30 games for MSU this season and leads all MVC freshmen in blocked shots (46) and rebounds (183) while posting the third-best freshman totals in assists (43) and steals (21). His 6.1 rebounds per game represent the sixth-best overall effort in the MVC, while his 1.9 offensive rebounds rank fourth and his 1.5 blocks rank second. He also has accounted for 34 dunks this season, the most on record by any Missouri State player. Dixon came into his own in conference play, averaging 9.6 points per game during the 18-game Valley stretch. He is averaging 1.3 steals per game which is the fifth-best total in the league and tops among all freshmen, while his 1.7 steals in conference games ties him for fourth overall with Wichita State’s Ron Baker. Likewise, Dixon’s 40 steals leads all MSU players and is the third-best season total ever by an MSU freshman. He is averaging 8.0 points and 2.3 rebounds per game. The MVC will announce its All-Bench Team and Most-Improved Team on Wednesday morning before it releases its Scholar-Athlete Team on Thursday. Paul Lusk’s Bears hit the hardwood at Arch Madness on Thursday evening when they take on the Drake Bulldogs at 8:30 p.m. The MSU pregame pep rally begins at 6:30 p.m. at the new Hangout location in the St. Louis Center City Hotel (400 S. 14th Street, St. Louis).